It is a rare and beautiful experience, walking into a film with low expectations and being totally blown away. The Great Debaters is the kind of film with an ending we know is predetermined before we walk in the theater - an inspirational film about a coach or teacher (in this case both) who takes a team no one has ever heard of (in this case a debate team) up through the ranks in unexpected ways to take on the national champions (in this case Harvard). Yet Denzel Washington, in his second feature film as director (after Antwone Fisher), directs with such love and obvious passion for his subject that it's hard not to get swept up in it. His subject is the Wiley College debate team from rural Texas, an all black college in the Jim Crow south in 1935. Washington himself stars as Melvin B. Tolson, their passionate and controversial coach, who leads them to greatness, challenging white colleges for the first time in a town filled with long standing, historical racism, and makes history in the process. It's a very familiar story, we have seen this many times before (and we've seen it before from Washington too, in Remember the Titans), but Washington takes a tried and true formula and infuses it with a heart filled with a fervor that is impossible to ignore. He has made a movie that truly has the power to inspire. Never before have I seen an audience break out into applause in the middle of the movie, much less twice, and then again at the end. It is that kind of movie - a crowd pleaser of the highest order, not cinematically groundbreaking by any means, but extremely well made. 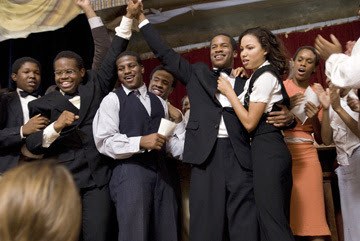 There is a fiery heart burning bright at the center of The Great Debaters, and it ignites the screen through a talented cast, featuring Nate Parker, Jurnee Smollett, Denzel Whitaker, and Jermaine Williams as the debaters themselves. At its core is a plea for tolerance and equality that we have heard before but can never be told enough. Washington has illuminated yet another uplifting underdog story of progress and made it into a totally winning film. As much as I would love to see my beloved Into the Wild among this year's Golden Globe nominees for Best Picture, I salute The Great Debaters and its achievement of working within a given formula and emerging triumphant with warmth and spirit. It's an old fashioned feel-good movie, well acted and solidly crafted - the kind of which there will always be room for. It's almost enough to restore my faith in mainstream filmmaking altogether. 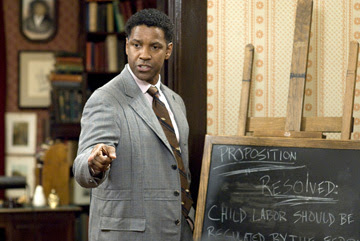 THE GREAT DEBATERS; Directed by Denzel Washington; Stars Denzel Washington, Nate Parker, Jurnee Smollett, Denzel Whitaker, Jermaine Williams, Forest Whitaker, Gina Ravera, John Heard; Rated PG-13 for depiction of strong thematic material including violence and disturbing images, and for language and brief sexuality.